When you borrow a product, Boulevard increases the inventory quantity by the number of borrowed products and adds this number to the Borrowed field in the Product form. From the toolbar click Borrow. 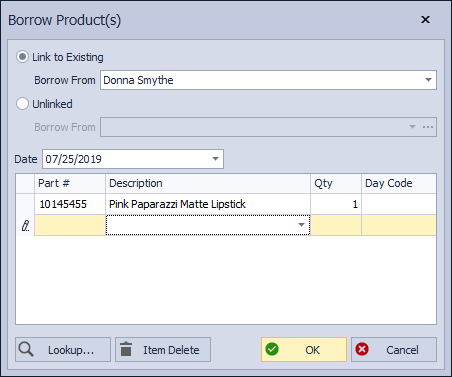 In the Borrow Product(s) form begin typing the name of the contact you are borrowing the items from (if the contact does not have a profile in Boulevard, and you do not want to create one, enter their name under Unlinked as shown in the image below).